The Indian Equity Markets remained volatile on expected lines. Though the benchmark NIFTY50 recovered smartly in the last hour of the trade by nearly 60-odd points, it still settled the day with net loss of 21.95 points or 0.20%. As we go ahead into the session on Thursday, we need to look at it in little special and different way. We face Union Budget, which is undoubtedly one of the most important domestic events that a Market faces. Having said this, we also need to understand that many times, pure technical reading is never enough on such days and we need to have a broader and macro view of the Market’s behavior. We expect a quiet start to the trade on Thursday and until the Budget proposals start rolling in, we expect range bound trade in the morning. Only after the proposals start rolling in, we will see volatility creeping in the session. 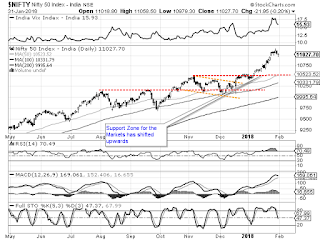 With the levels of 11,170 and 10,235 acting as immediate resistance to the Markets, we expect the levels of 10910 acting as strong support unless anything nasty comes up in the Budget. The Relative Strength Index – RSI on the Daily Chart is 70.4888 and it remains neutral to the price showing no divergence. The Daily MACD remains bullish. On Candles, an on-neck line occurred. However, in the present formation, it does not hold any significance. Pattern analysis shows that NIFTY has taken a breather after a stellar rally that it saw in January. It is seen taking a breather and has marked 11,170 as its immediate major resistance level. Overall, while we go into the trade on Thursday, we need to have a look at two to three previous sessions. While the front line stocks, and the benchmark NIFTY50 consolidated while the broader Markets saw some good correction. Also, if we look at sector Indices, barring the ones like IT, majority have not made any major headway since November and are already into what is known as time correction with minor declines. Also, the NIFTY PCR (Put to Call Ratio) which touched nearly 1.90 has come down significantly and more so after the short covering that was seen in Wednesday’s session. With all this, we can conclude that though volatility is something that will certainly remain; we do not expect any major downsides unless something very nasty comes up in the Budget. We expect effective sector rotation happening with focus on sectors that will benefit from the Budget and Markets are likely to move on after knee-jerk reactions. Major downsides expected only if fundamentally nasty proposals are left to be digested by the Markets.